This Luxurious Satin Contoured neck pillow is very versatile. The Satin Cover aids in reducing wrinkles on the face and keeping hairstyles in check. Use this pillow under your neck. The AB Contour pillow will support your neck and allow you to have comfortable support in your neck while sleeping. Help to relieve neck pain, stiffness and even tension headaches. An effective pillow if you have a cervical sprain or strain. 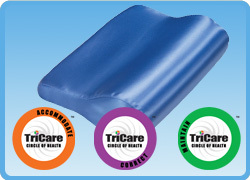 The AB Contour Pillow can also be used while sitting to relieve lower back pain. You can also use it as a headrest on a harder surface. This contoured satin pillow is constructed with high-quality, precision-cut foam to ensure years of comfort and use. The compact size of the AB Contour Pillow makes it a convenient traveling companion. Compact Size Use for travel and on any surface, Dimensions 14" x 91/2"